I occasionally get obsessed with a project that I just can’t get out of my head. 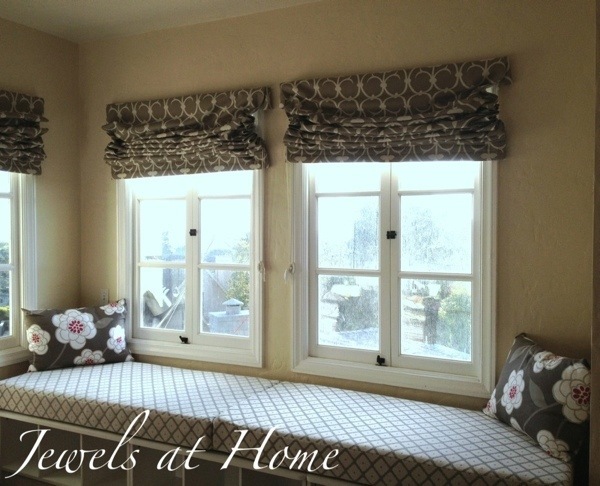 The window seat daybed in our master bedroom was definitely one of these! The daybed itself was easy to assemble from purchased benches and crib mattresses, but projects for this cozy alcove went on and on! One of the biggest was sewing the covers for the daybed mattresses. 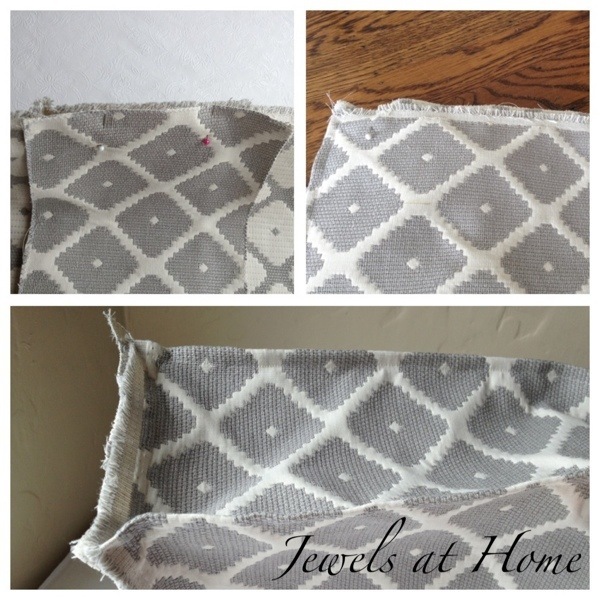 I love the Robert Allen Souk fabric in Dove, and I’ll show you how to make these covers yourself. As a guideline, I used these instructions from Kate at the Centsational Girl blog to sew the covers. My dimensions are different, and I didn’t see how she did the back corners, so I’ll show all the steps here. 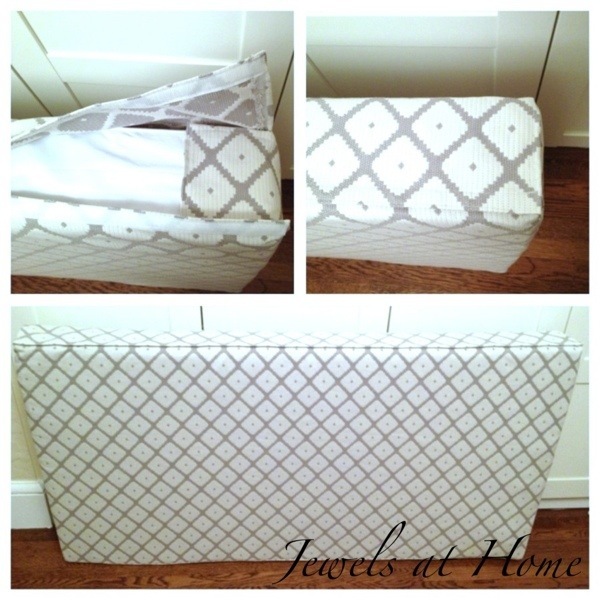 Because the daybed is made from crib mattresses that are 52″ long, I was able to use the full width of a standard 54″ wide decorator fabric across the mattress. 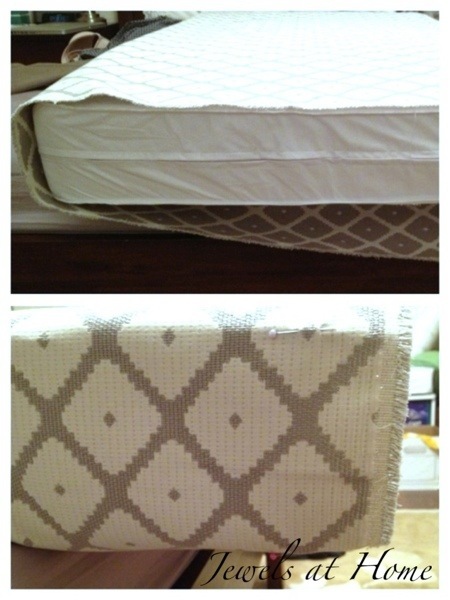 For each mattress, I cut a 70″ long x 54″ wide (full width) section of fabric and zig-zagged the raw edges of each piece. Mark the fabric to where the front seams will be. Fold and sew to create the front seams. 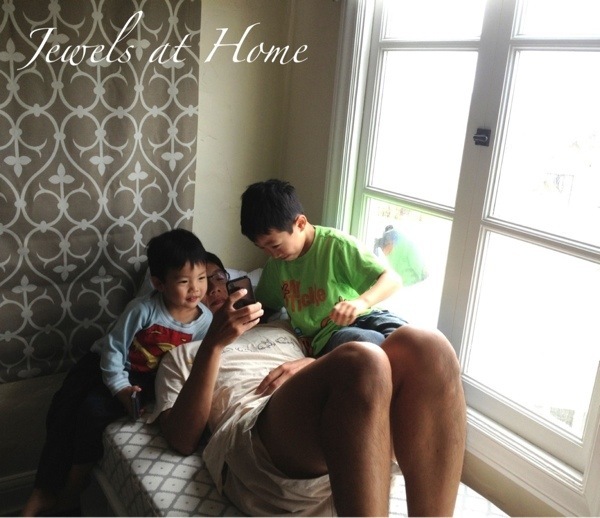 Each mattress required two 6.5″x 32″ side panels, and I again zig-zagged the edges. These are longer than the width of the mattress, so they can wrap around the back to keep any of the mattress from showing. 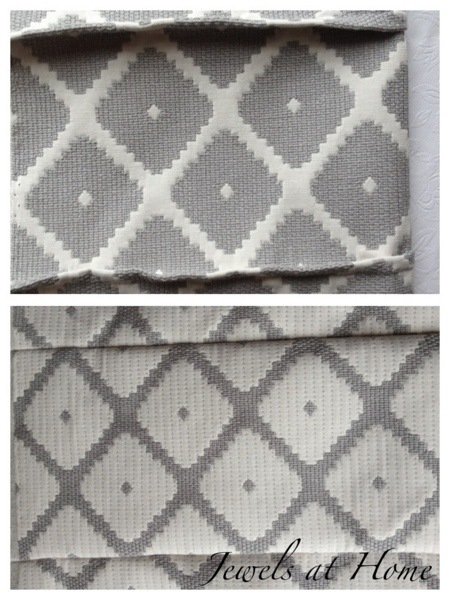 Adding the side panels to the cushion cover. Sew the front edge first and then the side seams. For the back closure, I had one short flap and one long one, so the closure was along the edge of the cushion. While this looks very neat when finished, in retrospect, I would have centered the closure on the back, so I could flip the cushion over if it gets worn without any of the closure showing at the edge. I sewed one side of the Velcro to the outside of the short flap and the other side to the inside of the long flap. (Top right picture below) It looks very neat when done! Finishing the cushion cover. Finish the edges of the side panels, so they can wrap around the back of the cushion. Sew velcro to the inside of one back flap and the outside of the other. Ta-da! I’m so happy with how these new cushion covers fit and look! A neat tip: to keep the cushions from moving around, I used a rug pad underneath. 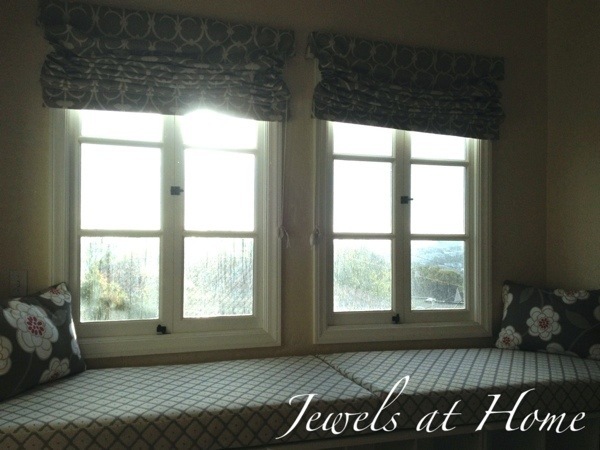 We’ve already started hanging out on our new window seat already, and there are just a few more projects left to finish up this cozy alcove! I’ve got more cushions planned, including round bolsters to finish off the ends of the bench. I’m looking forward to showing you the finishing touches soon! Great job! I am looking at ideas for a bench cushion that a friend asked me to sew. I never thought of making the box without cutting the pieces. Great idea! Thanks for sharing. Thanks, Nikki. I got lots of ideas from looking at others’ great projects, too. I’m glad we can all keep inspiring each other! Hi. Great job on the crib covers. I made a swing bed, and it has a twin mattress in it. I actually have mine pinned to the mattress because I ran out of the fabric. (Close out bargain priced at Fabricguru.com) I was figuring a extra long couple of zippers, but this looks much easier. Love it. Hit the thrift stores for pillows to cover, I always do the touchie feelie thing, looking for feather inserts, or pillows with body. Certainly saved money that way. Great job. Thanks! Yes, bargain hunting is so fun!